(4) information material to patentability will be defined by 37 CFR 1.56 for the purposes of a supplemental examination proceeding and any resulting ex parte reexamination proceeding. The material to patentability standard (37 CFR 1.56(b) ) applicable to patent applications is also applicable to an ex parte reexamination proceeding under 35 U.S.C. 257 resulting from a supplemental examination proceeding because, like patent application examination, an ex parte reexamination proceeding ordered pursuant to 35 U.S.C. 257 is not limited to patents and printed publications. In contrast, the material to patentability standard under 37 CFR 1.555(b), which is applicable to ex parte reexaminations ordered pursuant to 35 U.S.C. 302, is limited to patents and printed publications. Any reference to "applicant" in 37 CFR 1.56(b) will be read as "patent owner" in the context of a supplemental examination proceeding and any resulting ex parte reexamination proceeding under 35 U.S.C. 257, because these proceedings are only available to a patent owner. After the issuance and mailing of the supplemental examination certificate and the accompanying reasons document, the examiner will prepare an order for ex parte reexamination based on the determination made in the supplemental examination proceeding. To order reexamination under 35 U.S.C. 257, the examiner may use form PTO-2302 or include form paragraph 28.04 at the beginning of an initial Office action on the merits in the resulting reexamination proceeding. The order may refer to the reasons document that was created with the supplemental examination certificate. The supplemental examination proceeding, filed on , concluded with the issuance of the supplemental examination certificate on . The certificate indicated that one or more of the items of information submitted as part of the request for supplemental examination raises a substantial new question of patentability. See the Reasons for Substantial New Question of Patentability Determination in the file of this proceeding. Accordingly, ex parte reexamination of claim(s)  of U.S. Patent No. is ordered. See 35 U.S.C. 257(b) and 37 CFR 1.625(b). This ex parte reexamination proceeding is hereby initiated by the mailing of this order. Ex parte reexamination under 35 U.S.C. 257 will be conducted in accordance with 37 CFR 1.530 through 1.570, which govern ex parte reexamination, subject to the exceptions enumerated in 37 CFR 1.625(d), and, in addition, to the exception that a patent owner’s statement, including any amendment, under 37 CFR 1.530(a) -(c) may not be filed. See 35 U.S.C. 257(b). For this reason, no amendment in an ex parte reexamination proceeding ordered under 35 U.S.C. 257 may be filed until after the mailing of a first Office action on the merits (which appears below). This reexamination proceeding has been assigned to the art unit listed at the top of the cover page of this action. All future correspondence should be directed to the assigned art unit and should be identified by the control number, which is also listed at the top of the cover page of this action, and which is identical to the control number assigned to the now-concluded supplemental examination proceeding. A first Office action on the merits appears below. 1. In brackets 1 and 2, insert the filing date of the supplemental examination proceeding and the issue date of the supplemental examination certificate, respectively, as they appear on the certificate. 2. In bracket 3, list the claims for which a substantial new question of patentability was found, per the Statement of Reasons for Substantial New Question of Patentability Determination. 3. 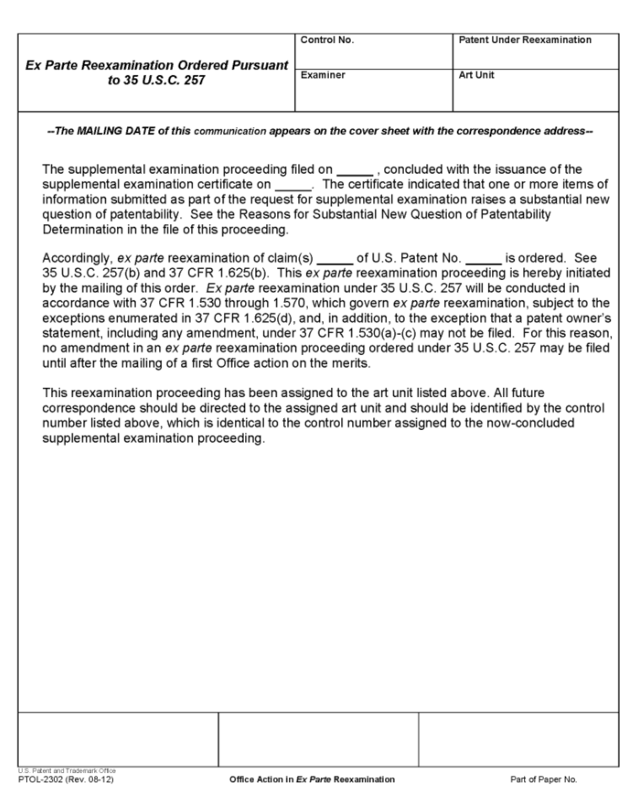 In bracket 4, list the patent number as shown on the supplemental examination certificate. See, generally, MPEP § 2254 and MPEP §§ 2260 - 2296 for a detailed discussion of ex parte reexamination procedures and processes. The guidance provided in MPEP § 2250 is applicable to amendments submitted after the first Office action in an ex parte reexamination proceeding resulting from a supplemental examination proceeding. As stated previously, a reexamination ordered as a result of supplemental examination is subject to the regulations and procedures of ex parte reexamination, subject to the above-noted exceptions.